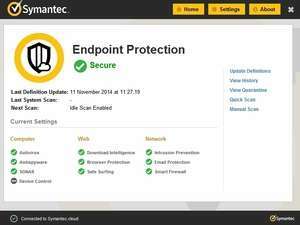 Symantec Endpoint Protection is security software to defend against ransomware and other emerging threats with multilayered protection that fuses signatureless technologies like advanced machine learning, behavior analysis and exploit prevention with proven protection capabilities like intrusion prevention, reputation analysis and more. Symantec Endpoint Protection can be used to shield commonly used applications against vulnerability exploits and isolate suspicious applications from malicious activity. For security reasons, you should also check out the Symantec Endpoint Protection download at LO4D.com which includes virus and malware tests. Additional screenshots of this application download may be available, too.